Youth 81 - A Different World Than Youth 05 When I Was 13! Wake Up and Return To Our GOD! Where is the true Church today? 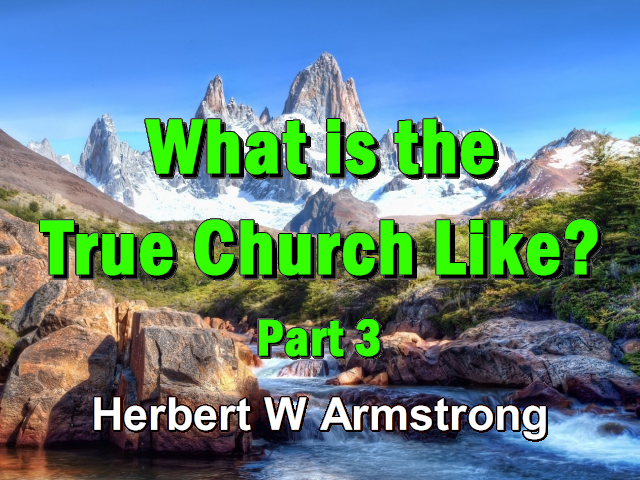 Which is the true Church — there are so many, many different denominations. Is any one of these, that you see, the Church that Jesus said He would build? Jesus Christ said, "I will build my church" (Matthew 16:18). Are all of these churches we see His churches of which He is now, at this time, the Living Head? Just what is the answer to this riddle about the true Church; which is the right one? Did the right church grow into great and politically powerful organizations divided up into many, many different denominations such as we see dominating the Western world today? Or did the true Church become perverted and then reformed about 500 years ago by a lot of denominations all divided against themselves? Or what has happened to the true Church? Now if you want to know what did happen, I'll tell you: there are two things to do. The first is to find out whether you can rely on biblical prophecy. I would say that the first thing is to find out whether the prophecies of the Bible that have been fulfilled up to this time — or that should have been — have really been fulfilled. And as an example, if you will start in the longest prophecy in all the Bible back in the eleventh chapter of Daniel — it's in fact the tenth, eleventh, and twelfth chapters, they're all one, long prophecy — and notice that, after just a few years from Daniel, certain things were to happen. And then 50 years later another thing was to happen — a certain marriage was to take place, for instance. And then a certain king would do a certain thing. And a certain army would do a certain thing. And every one of those things did happen. We know that that was written back there approximately 600 years before Christ. And a 100 years later, and 200 years, and three and 400 years later, those things were actually fulfilled. Other prophecies have been fulfilled right down to the very date. For instance there was a prophecy that Jerusalem was to be delivered into the hands of the British. And if you can figure the prophecy, as I did do, that Jerusalem was to be delivered on December the 9th, 1917. And I'd always supposed that, actually, it was surrendered and delivered on December the 11th. And you know, I came to find out that the actual surrender of Jerusalem to General Allenby of the British was December 9th, but the triumphal entry of the General into Jerusalem took place on December the 11th and so that prophecy stood fulfilled on the very exact day. Now if prophecy can be relied on — and I have proved that it can to my satisfaction — now it's up to you to prove to your satisfaction because perhaps what satisfies me doesn't satisfy you. Well you know this thing: finding the true Church and all of that sort of thing — actually it's between you and God — it's a private, personal matter anyway. So you have to be satisfied yourself. But I'm telling you how to find out. And if you can rely on prophecy, then there are two things in prophecy you need to find out. First, what IS the Church and what was to happen to it — well first what is it and second what was to happen to it? And there is a prophecy in the twelfth chapter of Revelation of the true Church. Now there is also a prophecy in the seventeenth chapter of Revelation of a large and a powerful false church that would become divided into many, many different denominations that was absolutely apostate and false and is called by a very, ugly name. But there is also the prophecy of the true Church, a persecuted Church in the twelfth chapter of Revelation. And they will be following the example and the customs of Jesus and of the apostles and the early Church as it was when it was led by the Holy Spirit. It will be the same in its doctrines and its customs in every way as the Church that was established by Jesus Christ. And you find the history of that in the book of Acts. Now we find that it was a Church that had to take correction and reproof from God. It was one that had changed its ways and had come out of the world and was different from the rest of the world and separate from it in that it recognized God as the Supreme Authority. It recognized the authority of God and the authority of His Word — the Holy Scriptures. And, consequently, because the rest of the world is not living that way, it sort of convicts and condemns the people that don't live that way. And immediately they begin to oppose and to persecute those who live the way of God — just as they persecuted Jesus; just as they persecuted, and even began to martyr, the Apostles. And so the true Church was to be a persecuted Church. It was prophesied it would be scattered; that it would not be politically powerful in any way. Now we pick up the history of that Church in the twelfth chapter of the book of Revelation. We started in it yesterday. Now on the face of it that sounds like rather strange language. Well it's speaking symbolically of course because nearly all of the book of Revelation — and that is the prophecies in Revelation — are in symbol. The whole book of Revelation is not symbolic, but its prophecies are. And the prophecies of the book are contained in the things that John — who recorded the book to writing — the things that he saw in vision. Now in vision he appeared to be taken to heaven where he saw a great many things. These things appeared in vision. Actually, it's the Revelation of Jesus Christ; and Jesus Christ is the One who interprets the symbols. Now here we find symbols. And in the fifth chapter of Ephesians, and then again in the eleventh chapter of second Corinthians, you will find that, 'woman,' is the symbol of a church because the true Church of God is in the position — spiritually and in symbol — in the position of being the affianced Bride, to be married to Jesus Christ when He comes to rule all the world as the KING OF KINGS AND THE LORD OF LORDS! And so one who joins the Church, in a sense, becomes engaged to marry Jesus Christ and we are in the position of the wife-to-be; and the wife must obey her husband. Now the Husband, Jesus Christ, said He obeyed His Father. And it's a family relationship: a husband and wife relationship and a son and a father relationship. And the Kingdom of God is merely the Family of God. It's a Family grown so great, ultimately, that it is to become a Kingdom that will rule the whole earth — a Kingdom of immortals, a Kingdom of divine Persons, divine Beings. The word, 'Elohim,' which is translated into, 'God,' in the Old Testament — and 'Elohim' is the Hebrew word that is used so many places in the Old Testament; and the word 'Elohim' means more than one person. It means, 'God,' but in more than one person — it is in the plural; it is a uni-plural. It means a kingdom of persons, but it's only the one kingdom. God is a Kingdom; God is a Family; it's only the one Family. There's the Jones family, the Smith family — one family, but many people. And the Church is compared to the human body — many members, but the one body. Many members, but the one Church. And Jesus said that He and the Father, which are two separate persons, are one in the same sense that He prayed the Father, that the Father would keep the Church one: many members, but only the one Church. And that one Church is to be translated, or converted, or changed into the one Kingdom — the Kingdom of God — and it's a Family. And Jesus Himself said, "That all power and all authority is given unto me" (Matthew 28:18). And the Father is committing that authority to Jesus Christ. And Christ said that when He comes that the saints, then translated into the Kingdom of God — no longer human, no longer mortal, but now divine and immortal — He said, "To them will be granted to sit with Him in His throne" (Revelation 3:21 paraphrased)...which will be the throne of His father David here on the earth. Now there's one Lawgiver and that's the Father. And the whole Family of God obeys. And the Family of God is going to take over the rule of the earth — the Kingdom of God. And the whole message, the whole gospel of Jesus Christ, was the Kingdom of God. It's a Kingdom into which we may be born. But it's also — a kingdom is a government — a government that rules, and we are to be given the rulership over the world. But what about that Kingdom in this time now; what about that Kingdom in this time now? This prophecy tells what was to happen to that...well it isn't the Kingdom yet. It's only the Church. And it's the Church of God now and it is to become the Kingdom of God at the time of the Coming of Christ and the resurrection "when this mortal shall have put on immortality" (I Corinthians 15:53). , yes, and when we will no longer be human and mortal. Now it was not the New Testament Church. They didn't have salvation; they didn't have the gospel; they didn't have the Holy Spirit; it was quite different. They had carnal and material ceremonies and sacrifices and things of that sort that the Church does not have because they were all a substitute for Christ and for the Holy Spirit which has been given to the Church of the New Testament. But this was God's Church and the only Church that God had on earth. So this great dragon is not — I know at least one denomination has claimed — pagan Rome. This great dragon is simply the Devil who, because of his perversion became perverted in all of his ways, was changed into the Devil. And he did it himself. In the first chapter I read to you yesterday that stars are the symbol of angels. That's not my interpretation; that's the interpretation of Jesus Christ because He is the Revelator. And here it is in the twentieth verse of the first chapter, the seven stars: "The seven stars are the angels of the seven churches" (Revelation 1:20). So stars, there, are used as a symbol for angels; that's the key. And here the third of the angels became demons and followed him. Now notice that here is the Devil with his angels following him. They are apostate; they have turned away from God in every way. The Devil was not able to devour Jesus — either His physical body when He was a baby, or to devour Him spiritually by the temptation on the mount. And Jesus conquered him; Jesus finally gave the Devil an order and he slunk away. And so Christ conquered Satan and qualified there to rule the entire world. Satan is the invisible ruler of the world now, who holds sway, because God permits it. God is ruler of the whole universe and God permits Satan to continue for a purpose and for a definite length of time. Satan can do nothing God doesn't allow. Above all, God is Supreme Ruler over all, but God is allowing a certain influence to Satan. Incidentally, the Devil has no power to force you to do anything. Sometimes people get scared about the Devil and they get scared about a demon and whether a demon can get into them. Now no demon — and demons, incidentally, do enter people; there are people who are demon possessed. And the insane asylums are filled with them. But let me tell you something: no demon can enter you and possess you and take possession of you like they do of 'crazy people,' as we call them, or 'insane people,' unless you permit. Now I'll tell you this: if you get into a meeting where you are giving way to your emotions and you just try to open your mind to let any spirit — without any precaution as to what spirit — enter in, you can become demon possessed. And many people have by that process. Now there's another way a demon can get into you — that's when you lose your mind by losing your temper. You can lose your temper to such an extent that you have lost control of your mind and a demon can seize control at that minute. But as long as you just 'keep your own head,' as we say. It's something like being hypnotized. I don't know very much about hypnotism — and somehow or other I don't care to know — but I know that it's generally conceded that it is a fact and it is a thing that can be done. But this much they always say: that no one can be hypnotized unless that person yields to the hypnotist and yields the mind and permits the other mind to dominate. Now I have always known that no one can hypnotize me as long as I, well, as long as my mind will not permit it and just dominates over the other person, as I think it usually does, and will not permit my mind to just yield and to obey and to yield to their suggestions, the power of suggestion, the psychological suggestions that a hypnotist would try to use. No one can hypnotize me; no one can hypnotize you. Now, in the same way, no demon can enter you unless you permit it — either by anger, I mean excessive anger, losing your temper until you've lost your head — or where you completely lose your mind and your head, even seeking the Holy Spirit of God and forgetting that God said to: "...try the spirits and that there are many false spirits gone out into the world" (I John 4:1 paraphrased) — as many as false human preachers. And when the Bible says, 'spirits,' it doesn't mean human beings; it means spirits. It was a few hundred years later that this happened, but here is a woman that was persecuted; here is a Church that was persecuted and had to flee. And this Church, we know from history, had to flee from the popular churches that were organized and were having a relationship with the kingdoms of this world, the governments, the civil governments, the political governments of this earth. She is a pretender; she is a counterfeit; she calls herself Christian; she pretends to be the Christian Church; she uses the name of Christ; she takes the name of Christ and says that He is the Christ and uses that very thing and the prestige of the name of Christ to deceive the whole world. Jesus said, "Many will come in my name [not in some other name, but in the name of Christ] and deceive the world. They will come saying that I am the Christ" (Matthew 24:5; Mark 13:6; Luke 21:8 paraphrased). He didn't say they'll come saying they are the Christ. He said the people will come saying, "I, Jesus, is the Christ." That's what He said. And that's what they've done. And oh they extol Him; they laud Him, but they deny His message. They don't preach His gospel; they don't preach repentance. Someone was telling me that when you find so many religious programs on the radio almost all day long — I think that, perhaps, every half hour, every fifteen minutes or half hour all day long on Sunday — if you just turn the dial to the right spot you could hear a religious program. And someone who had listened to, I don't know how many of them, told me that, that except on the 'World Tomorrow' program, they had listened to all of these programs and all these religious programs and on not one of them had they not heard one word telling the people, "You have to forsake your thoughts and your ways; you have to repent. And sin is the transgression of the law of God. Repent against your rebellion against Almighty God — that God is the Ruler; and sin is the transgression of the law of God and the rule and the reign of God." Not on one of them did they hear it. Why don't you listen and see how many teach that and where you hear it and where you don't. Jesus came preaching the gospel of the Kingdom of God and saying — what? "Repent ye, and believe the gospel" (Mark 1:15). They say — they don't even tell you to believe the gospel today. They just say, "Believe on Christ." She is the one who caused them to be martyred; she is the persecuting power but here's the true Church in the twelfth chapter of Revelation and she is a woman who was persecuted and whose — many of whose members were martyred and those who escaped death, fled. And I gave you the symbol for that, or the interpretation of the Bible, not any man's interpretation. But you find it in the fourth chapter of Ezekiel (Ezekiel 4:1-6). You can find it if you want to where a day is a year. If you have a concordance you can find it very quickly. Now there's the angel — I mean the Devil and a third of the angels followed him and he stands up against Michael. There is war in heaven. Michael and his angels fought against the dragon. "And at that time shall Michael stand up, the great prince [or archangel] which standeth for the children of thy people [he's the archangel for our people, incidentally — the white English-speaking people. Now when Michael stands up, he stands up against someone. And back here in Revelation 12 we found out who he stood up against — the Devil and all of his cohorts. And so it says] there shall be a time of trouble, such as never was since there was a nation even to that same time: and at that time shall thy people be delivered, every one that shall be found written in the book. And many of them that sleep in the dust of the earth shall awake, some to everlasting life" (Daniel 12:1-2). The others don't awaken till later, so I won't read that now. My friends, the Kingdom of God has not appeared yet on this earth. Jesus went to heaven to get a Kingdom and to return. And the Kingdom of God will appear at the Second Coming of Christ and salvation with Him — salvation has not come to anyone yet. We are only the heirs of salvation, not the possessors, so far, in this life. But not very many seem to realize that. And there's more to it we'll have to take tomorrow. But it was the woman who had the commandments of God and the testimony of Jesus. There's your true Church in the seventeenth verse. And again she has to flee for 1260 days. My friends, that is the time of trouble and it is the great tribulation that's coming. We'll have to take that up again tomorrow. And I'll give you more of that startling prophecy! Listen, write in for our booklet on Easter :'The [Plain] Truth About Easter', the truth about the Resurrection - it was not on Sunday!.' And the crucifixion was not on Good Friday! Write in for the booklet on Easter and the booklet on the Resurrection. There is no charge.